Seventy-six years ago, on August 8, 1942, six German “spies” were executed in Washington. 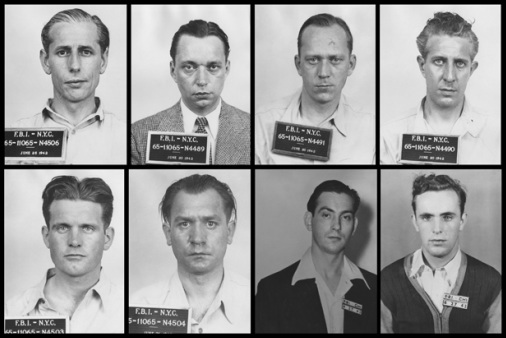 Eight German saboteurs were put ashore in Florida and New York during World War II. They were to destroy aspects of America’s war production, but most, apparently, had no intention of doing so. Herbert Haupt was a naïve young man interested in good times and ran away to Mexico to avoid responsibilities. He and his friend Wolfgang Wergin spent three weeks in Mexico until they ran out of money. They couldn’t return to the US unless they paid a duty on the car Wolfgang sold when they were broke. Since they were both naturalized Americans of German birth, the German consulate got them passage on a ship going to Japan. From there, they went to Germany. Herbie jumped at the chance to return to the US with the saboteurs; Wolfgang declined, believing the G-men would get them. He ended up fighting in the German army on the Russian front. Not until 1956 was Wergin able to return to the United States. Among the seven other saboteurs, one was a survivor of Gestapo torture and imprisonment; another was badly wounded in the Wehrmacht. George Dasch intended all along to turn them all in as his way of fighting the Nazi regime. The actions of Herbert Hoover and the FBI are disgusting. The saboteurs’ treatment and trial were never about justice, but about appearances and a moral victory over Germany. Six were executed. Dasch and Burger were repatriated to Germany in 1948, but their lives were ruined. And Hoover wanted glory. He was more guilty than the saboteurs, lying to them, trying to hide the fact that Dasch went to the FBI rather than the FBI discovering a nefarious plot afoot. Hoover should have been executed. A new book, Enemies: A War Story by Kenneth Rosenberg, is a fictionalized account of the saboteurs. I recommend it.